Dominating the West End with the ever-successful The Play That Goes Wrong and runs of shows including their festive hit Peter Pan Goes Wrong and Mischief Movie Night, Olivier Award winning Mischief Theatre showcase their latest side-splitting farce in the glittering West End. 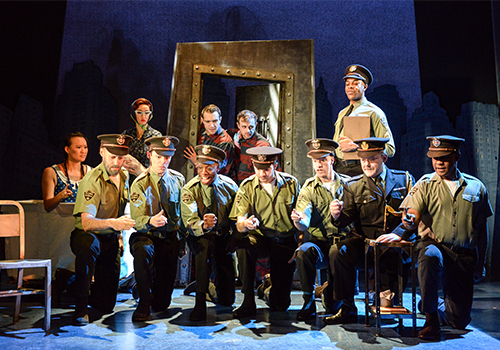 Opening at the Criterion Theatre in April 2016, following the departure of The 39 Steps, The Comedy About a Bank Robbery continues to wow London audiences. Directed by Mark Bell, the play is the not-so-typical story of a heist gone disastrously wrong, and promises to fully entertain audiences. Diverting from their usual haphazard attempts at staging a spectacular, The Comedy About a Bank Robbery follows eight inept criminals in their efforts to sneakily steal a huge diamond from under the nose of a slumbering security guard. Of course, they are met with a multitude of mistakes, resulting in chaotic but hilarious consequences. 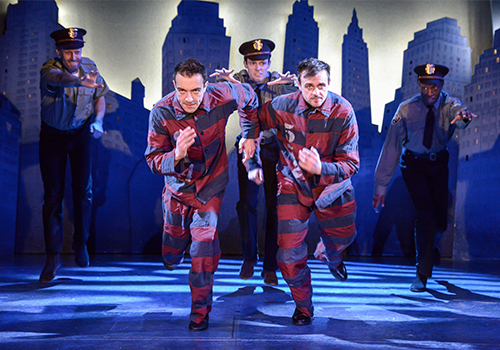 Created by the masters behind Mischief Theatre, Henry Lewis, Jonathan Sayer and Henry Shields, The Comedy About a Bank Robbery continues to prove itself as one of the funniest shows in the West End. First formed in 2008 by LAMDA students, Mischief Theatre is a company devoted to bringing back traditional slapstick, with moments that follow suit of comic champions such as Laurel and Hardy. 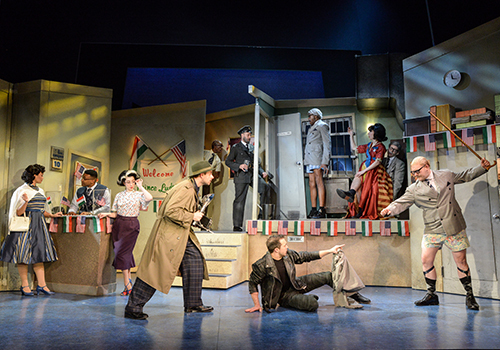 The Comedy About a Bank Robbery features design by David Farley and costume design by Roberto Surace. Casting includes Sean Kearns as Robin Freeboys, Jean-Luke Worrell as Warren Slax, Liam Jeavons as Mitch Ruscitti, Jack Whittle as Sam Monaghan, Julia Frith as Caprice Freeboys, Tania Mathurin as Ruth Monaghan, Jeremy Lloyd as Officer Shuck, Laurence Pears as Neil Cooper and Chris Leask as Everyone Else. Additional casting includes Paula Kay, Mike Bodie, Niall Ransome, and Lydia Fraser. From 15 January 2019, Gareth Tempest returns to the part of Mitch Ruscitti while Emily Stott plays the role of Caprice Freeboys. The production features design by David Farley and costume design by Roberto Surace. 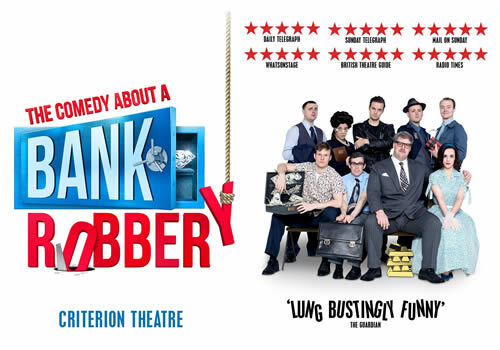 Playing at the Criterion Theatre, The Comedy About a Bank Robbery is the West End's unmissable comedy, from the creators of the incredible Goes Wrong series. 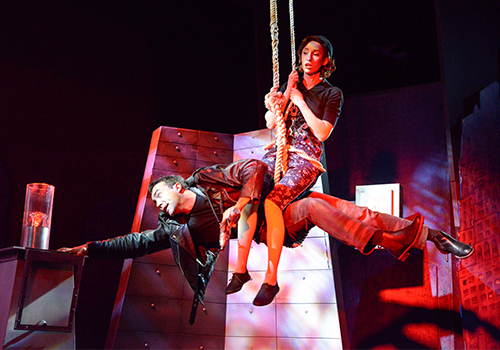 The Comedy About a Bank Robbery is recommended for ages 10 and up. Under 5's will not be admitted.